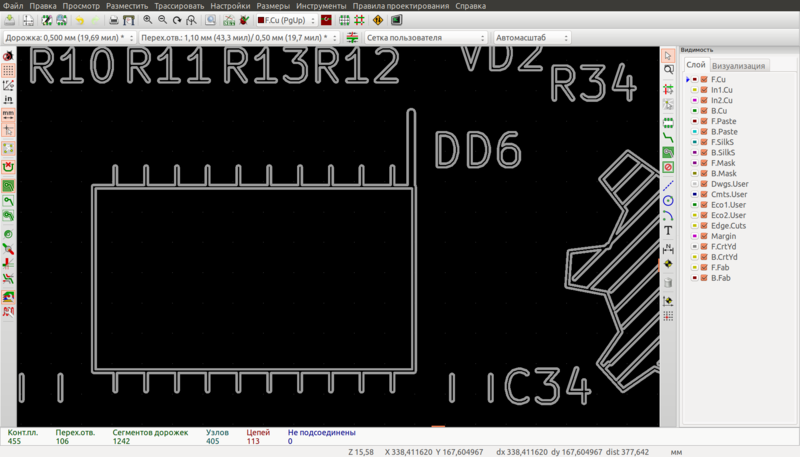 Pcbnew plot dxf draws 2 lines instead 1 with the right width. It will be usefull to select to plot in two modes: as is (with lines width) and sketch (w/o width). > ** Patch added: "0003-Pcbnew-plots-to-DXF-arcs-with-valid-width.patch"
problem is DraftSight and not your patches. using that renders these DXF files with line thickness? > ** Attachment added: "dxf-test.kicad_pcb"
@Wayne, I open this DXF files with KiCad import (that support line thickness). > @Wayne, I open this DXF files with KiCad import (that support line thickness). Is it important to import Fabrication layers with thickness for you? silkscreen layers which are part of the board representation. > Is it important to import Fabrication layers with thickness for you? I am using acmecad (a free tool) to display dxf files. It is seen like a reference to display dxf files by many users. It also shows items without thickness. It all tools used to display items with thickness show these items without thickness, there is a problem. I also tried Librecad, with no success (lines have no thickness). Only pcbnew (which uses the dxf library used in Librecad!) shows the thickness. I'll try to test this dxf files in Solid Edge, Autocad, Inventor, Kompas yesterday in my work. > I also tried Librecad, with no success (lines have no thickness). > Only pcbnew (which uses the dxf library used in Librecad!) shows the thickness. I have tried to open these files Autocad 2011, Solid Edge ST8, Kompas 16. All no import line width. I can to make option plot in outline or line width mode (for future usage). For me outline mode usable for topological and unusable for plot fab layers. I am open to the idea of making line thickness on DXF plots optional. The existing behavior should be the default. their behavior. This will do nothing but confuse users. > I have tried to open these files Autocad 2011, Solid Edge ST8, Kompas 16. All no import line width. > I can to make option plot in outline or line width mode (for future usage). > For me outline mode usable for topological and unusable for plot fab layers. Ok. I do it (plot with line width) optional. I add rebased patch set with option ploting lines in outline mode. @Wayne, can you watch it? I understood probably Thickness parameter in DXF it is need for extrusion because graphic ENTITY have parameter 'Extrusion direction' and doesn't have extrusion height parameter. And https://a360.autodesk.com/viewer/ use the Thickness parameter as extrusion height. 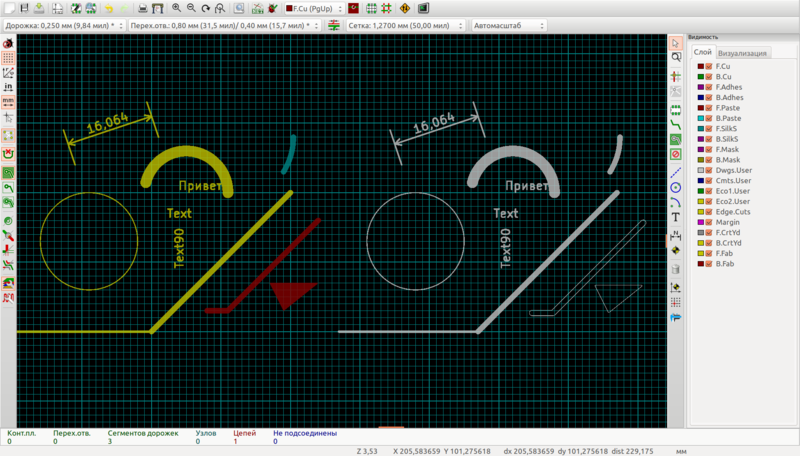 Kicad DXF import interpretate extrusion thickness as line width. Probably DXF doesn't support lines width. Maybe I should use Plot mode option Outline or Sketch. Then I rebuild my patches. > line width. Probably DXF doesn't support lines width. @Wayne, my last patch doesn't use the DXF line thickness parameter. I add option 'Plot line in outline mode'. If it is disabled then plot lines without thickness (in sketch mode). I agree with you, we shouldn't use DXF format in a non-standard way. I didn't patch Kicad DXF import. I think it is bug in Pcbnew to use extrusion thickness as line width. Can you watch my last patch? @Eldar, all of the links to the patches in this response seem to be broken. > @Wayne, my last patch doesn't use the DXF line thickness parameter. I add option 'Plot line in outline mode'. If it is disabled then plot lines without thickness (in sketch mode). I agree with you, we shouldn't use DXF format in a non-standard way. > I didn't patch Kicad DXF import. I think it is bug in Pcbnew to use extrusion thickness as line width. > Can you watch my last patch? > ** Patch removed: "0001-Pcbnew-plots-segments-to-DXF-copper-mask-adhes-paste.patch"
> ** Patch removed: "0002-Pcbnew-plots-to-DXF-circles-with-valid-width.patch"
> ** Patch removed: "0003-Pcbnew-plots-to-DXF-arcs-with-valid-width.patch"
> ** Patch removed: "0004-Make-option-to-plot-lines-in-outline-mode-optional-i.patch"
> ** Patch added: "0001-Enable-for-pcbnew-plotting-to-DXF-lines-in-outline-m.patch"
It will be cool if you released this fix later.